I've just returned from a four day visit to my youngest son and his family in Nottingham. When we got back the weather was nice and calm so, although we're well into December, I thought it was worth an early morning at the coast. I set the alarm for six (no need for getting up in the middle of the night at this time of year) and went to bed. As usual I was awake before the alarm sounded so I crept downstairs, grabbed the bag and the rod, slung them into the car and set off. For once the weather gods were kind. There wasn't a breath of wind and I didn't even need gloves. Although it was still pretty dark when I reached the beach, it was obvious that the sea was flat calm. I was using my little four-piece spinning rod and whiplash braid on the Stradic. My short, Amnesia trace was armed with an 18cm Pearl Evo Redgill. On the first chuck, as I drew the line tight, I felt a slight rattle. "Tiny pollack," I thought but for the next twenty minutes there was nothing else. 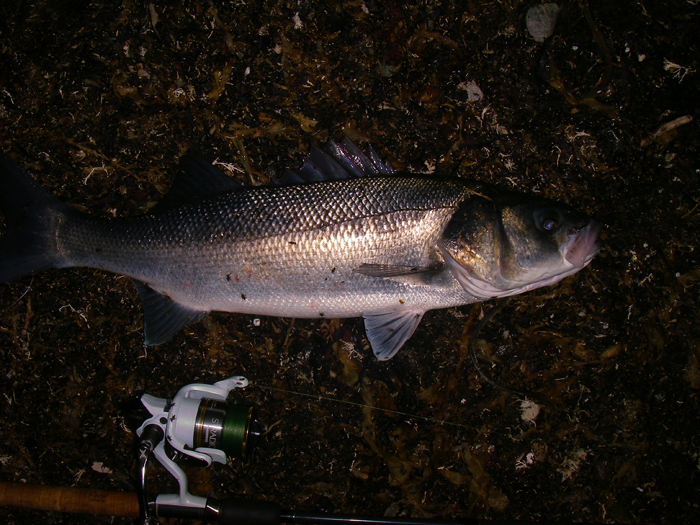 It was still pretty dark when I saw headlamps approaching along the shore and two other anglers trudged past me and began to set up their gear only a few metres from where I stood. I cast again and began to wind the lure back at a slow, steady pace. 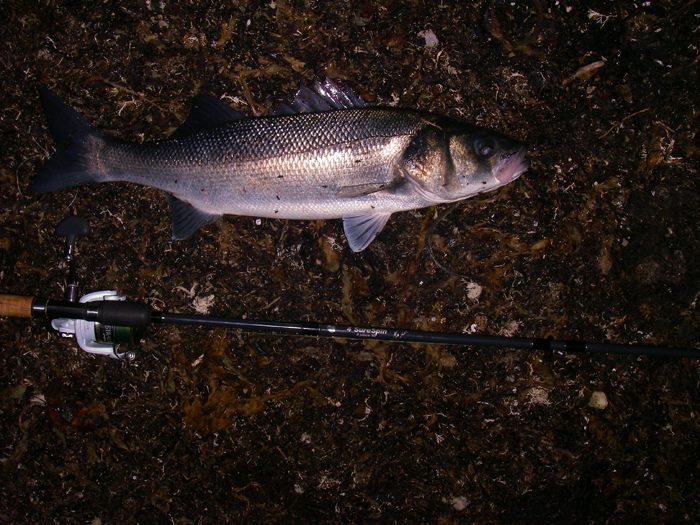 It was probably less than ten metres out when the rod crashed over and line began to zip off the reel. Clearly I was into a decent fish as it made several strong runs. After a few minutes I could see the bass thrashing in the water's edge and I was able to slide it ashore onto the weed pile. After taking a couple of pictures I removed the hook (nicely in the scissors), weighed the fish (almost exactly eight pounds) and slid it back into the sea. After a couple more casts I packed in and walked back to the car where the clock said 07:15 - not a bad half-hour's fishing. Must try again soon.